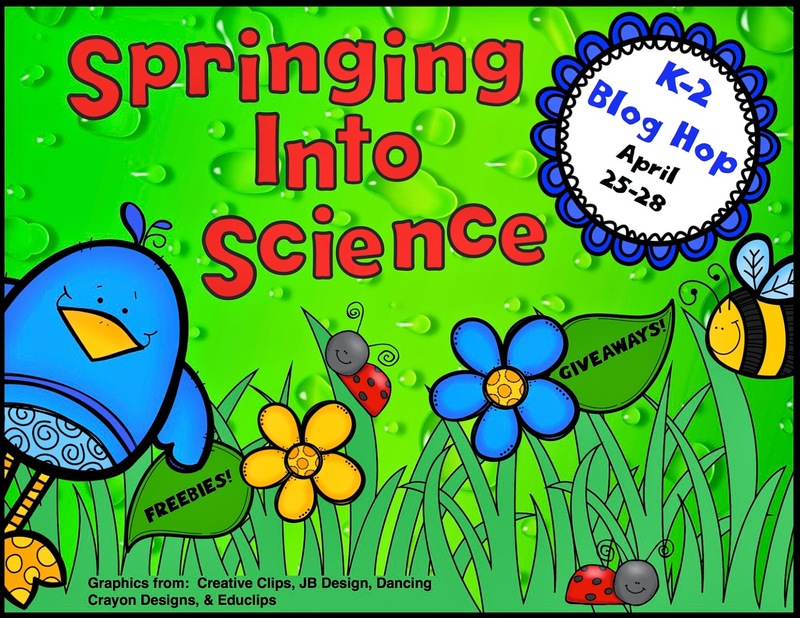 Springing Into Science K-2 Blog Hop - WEATHER PALOOZA! I loveeee blog hops, mostly because I get to find out about other amazing blogs and learn a thing or two....or much more most of the time! I love that this blog hop is Science themed because I've started noticing that I love creating Science related products more than any other kind! My best seller on TPT has become my Landforms and Bodies of Water unit, and I never thought that would be the case! This time around, I am going to share with you my brand spankin' new unit on WEATHER. 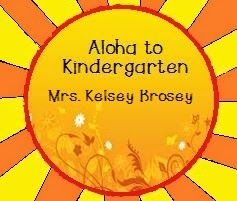 I loveeee teaching about weather. I think there are so many different facets to it, but my most favorite part is the water cycle. There are more activities out there to teach this concept than I could count. I have a few favorites that I've been doing year after year, but this year, I actually made up professional looking..ie..not hand scribbled...templates for a lot of the projects. 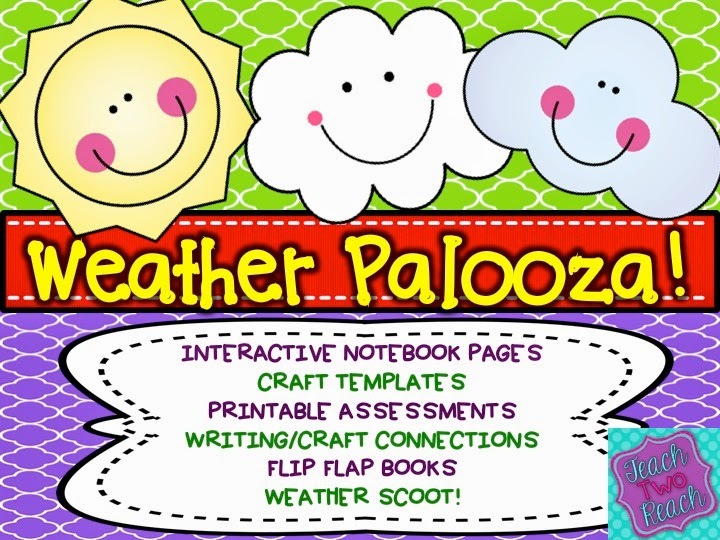 This year I've also delved into interactive notebooking and my class loves flip flaps. We do it for all the subjects, but I see that those little flippity flaps are most helpful to them in Science and Social Studies because they can take their notebooks home to study the concepts in a quick and clear format. This unit includes tonnsss of stuff all about weather. I had the kids do interactive flaps for all the weather science related concepts in their textbook. 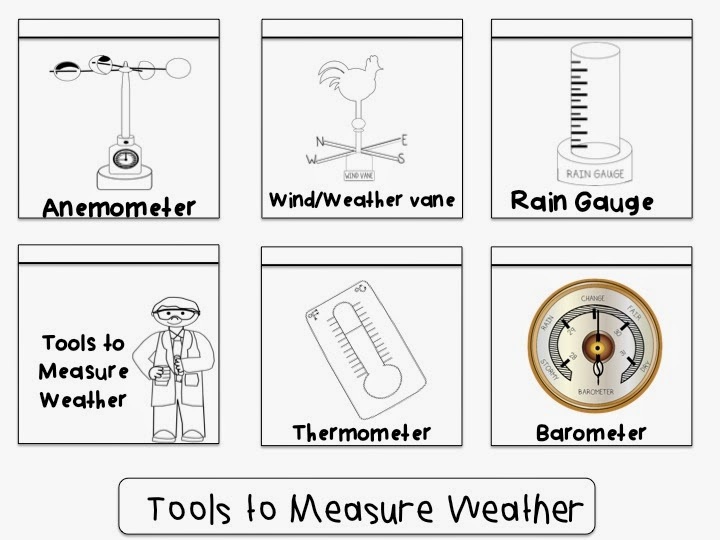 This includes learning about the seasons, types of weather, instruments to measure weather, the water cycle, and types of precipitation and clouds. 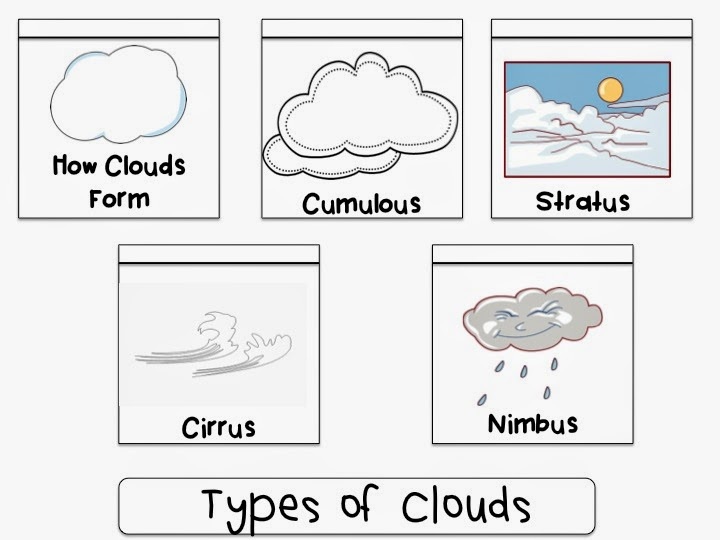 Next, I have them learn about different types of clouds through a couple of different activities. 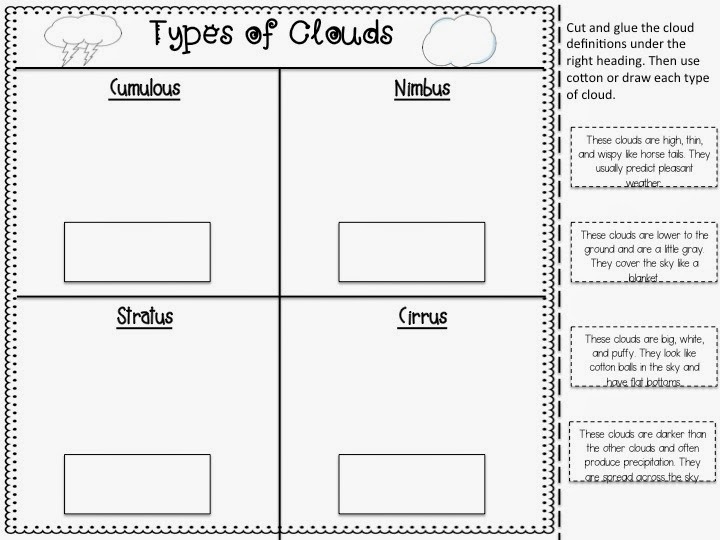 For both of these next two projects, they used cotton, but your students can also just draw the different cloud types. For the flip booklet, they had to write about each type of cloud and use cotton to show what they look like. For the cut/paste, they glued the definitions next to the correct name of the cloud and then used cotton again to show the way they looked. Precipitation types are always fun to teach!! I have the kids make a mobile. I provided two types of raindrop templates. 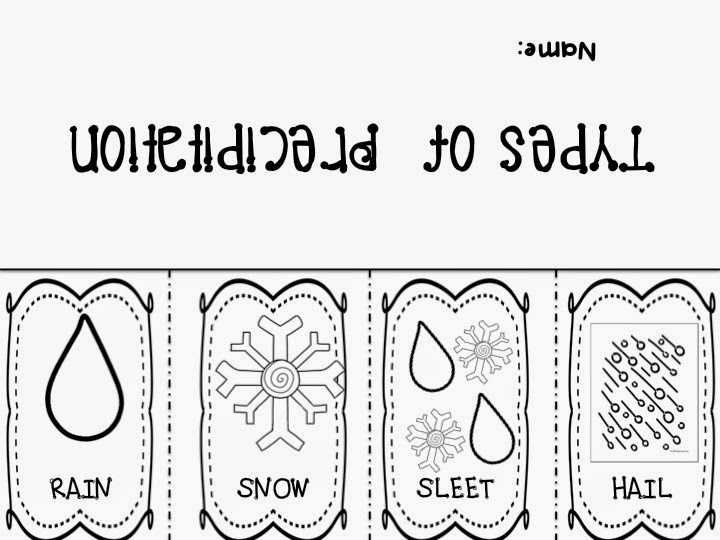 One with lines, so they can write their own definition of each of the types of precipitation; rain, snow, sleet, or hail. And there are raindrops that are blank so they can cut and glue the correct definition. Then they hung it with yarn to the cloud template. For group/partner work, I have them get together with 3 or 4 other kids. Each group is assigned a season. 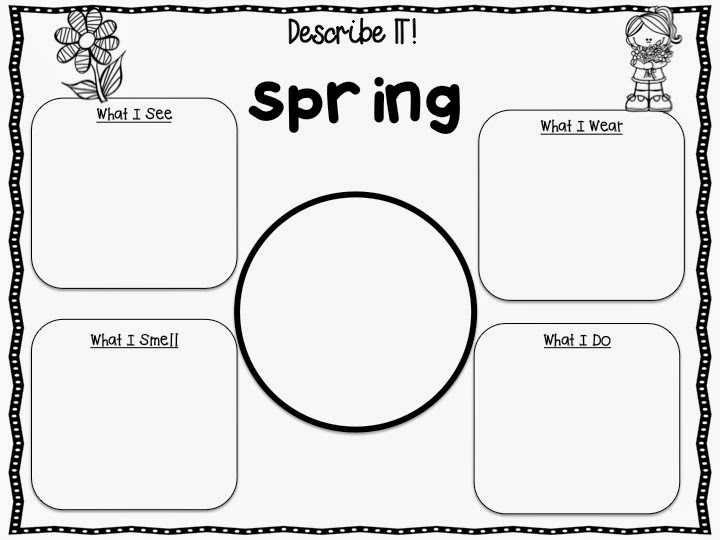 They have to work together to come up with descriptions for each type of season and fill out the following organizer. Writing is always important to integrate. We included persuasive writing in this unit. Students had to write a persuasive piece on which season is the best. Now, let's get to my favorite part of the whole unit. There are tons of water cycle activities in this unit. For one of them, I read a short "skit," about students pretending to be water droplets and moving through the water cycle. They act it all out. Then they sequence the steps with the sequence strips provided. It's awesome because they acted it all out, so they have a much better understanding of it as they are sequencing. We also made a water cycle diagram with the evaporation, condensation, and precipitation definitions and cutouts I provided. They used glitter glue, chalk, construction paper, and cotton, to put it all together. And last but not least, was their favorite part - the water cycle hat! Would you like to win this unit?? Just enter the Rafflecopter below! Plus, this unit is on sale all weekend. 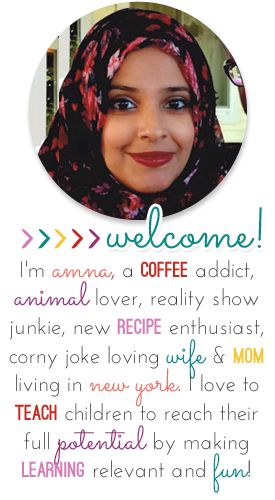 Thanks for visiting and now hop on over to the next blog! What a great unit! So creative! I would love to win this! This looks amazing! Love the hat! Thanks for the great ideas! Darn - Missed the giveaway! These lessons look awesome. Thank you for sharing. Time for another TRADE AND GRADE Blog Hop! Five for Friday- tons of stuff happening! Five for Friday - and a Fundraiser!